Wake Forest President Nathan Hatch shares how he knew the legendary golfer with the Old Gold & Black. I remember the first time I visited Arnold Palmer in Latrobe, Pennsylvania, I walked around his office, taking in the displays of memorabilia that marked moments of his life: four Masters trophies and the corresponding scorecards, President Dwight Eisenhower’s golf clubs, a Norman Rockwell portrait of the golfer, the Presidential Medal of Freedom and the Congressional Gold Medal. He still had the Pennzoil tractor that co-starred with him in early television commercials, reels and reels of tournament film on bookshelves and all of the golf shoes and clubs he used throughout his career. And on the wall to the left of his desk is his chapter on Wake Forest. There is an aerial photo of campus, a picture of the Quad after it had been rolled, his honorary degree and a photo of him speaking at Commencement in 2005. In the center of that collection is a picture of a college-aged Palmer with his best friend. They were holding a trophy — evidence of a Wake Forest golf victory. Over the last decade, it has been a delight to get to know Palmer. He was a gentleman of great warmth and grace, a person who sustained meaningful friendships and one who loved Wake Forest and did a tremendous amount to support and advance our university. Palmer loved people, and he treated them with dignity and respect. He kept every gift that anyone ever sent him: posters from local Girl Scout troops, honors from Rotary Clubs around the country, customized golf equipment. He signed every book, photo and pin flag put in front of him; he had stacks of items ready to be signed and mailed back to waiting fans. And he welcomed visitors into his world with gracious hospitality. Palmer often entertained groups of Wake Forest alumni and friends in Latrobe. He would invite the group to tour his office, pointing out special trophies and awards and explaining the context behind the pictures that overtook his walls. During those visits, he would prove his great ability to captivate people with his stories. One story often recanted involved President Eisenhower, after leaving office, showing up unannounced on his doorstep in Latrobe as a birthday surprise. Then, there was the one where he beat the great Yankee Roger Maris to win the 1961 Hickok Belt given to the professional athlete of the year. There was another story about how he broke all kinds of aviation records flying a plane around the world. It was his love of people that made him a good friend. His loyal assistant, Doc Giffin, had worked with Palmer for more than 50 years, and the other staff in his office counted their years of service in decades, too. When he met you, it was as if you had been his friend for years. As a professional celebrity, he reached the heights of fame and fortune. He’s probably the most important golfer that has ever lived. He built an enormously successful business, won scores of distinguished awards and has dined with presidents and kings. Through all of it, he never forgot who he was or from whence he came. Palmer didn’t come from privilege. His father, who had worked in steel mills, became the groundskeeper — and eventually the club pro — at the Latrobe Country Club near Pittsburgh. Arnold Palmer learned golf from working on golf courses, not from enjoying them as places of leisure and privilege. Even with his vast success, he remained deeply committed to his hometown. Latrobe is not a large or pretentious place, but it was Palmer’s home and he loved it. He invested in its people and organizations. He operated the country club where his father had worked, and he ate lunch there every day. He also remembered Wake Forest. More than any other person, Palmer is responsible for the great golf tradition that Wake Forest enjoys. He came here almost by accident, following his friend, Bud Worsham (’50), who had been a highly sought after golf recruit. Palmer’s meteoric rise on the professional tour after leaving Wake Forest enhanced the university’s reputation, and his scholarships served, in time, to recruit a host of superb athletes like Curtis Strange (’77), Billy Andrade (’86) and Webb Simpson (’08). This week, Wake Forest lost a giant. We lost a gentleman who loved people — a man who offered us the depths of his kindness. 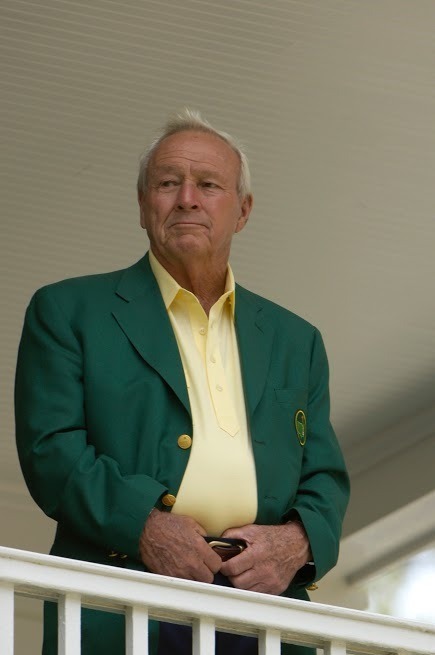 We lost a legend who changed the way we play the game of golf. And we lost a friend who displayed what it meant to live with character and honor and so inspires us to do the same.